If you are in Santa Fe, stay at the La Fonda. Why not? It has all the historic charm of the Ahwahnee Hotel in Yosemite, or the El Tovar at the rim of the Grand Canyon. It is not located in a national park, so it went through some hard times before being lovingly restored to splendid 1920’s level grandeur. And it is MUCH more affordable than the Ahwahnee with all the wonderful hand-hewn timber, eccentric architecture (there are at least three different ways to get to any given room), interesting restaurant menus and wonderful service. Once you have finished your city tour, you will want lunch. There you are on the plaza/. 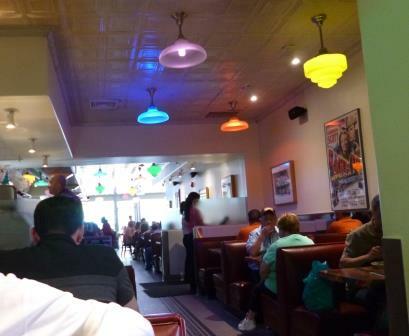 Try the Famous Plaza Cafe – lots of history on the plaza, pressed tin ceiling, friendly and fast service, and killer fish tacos. Now it’s time for the museums. The New Mexico History Museum is a GEM according to AAA’s road guide, and rightfully so. 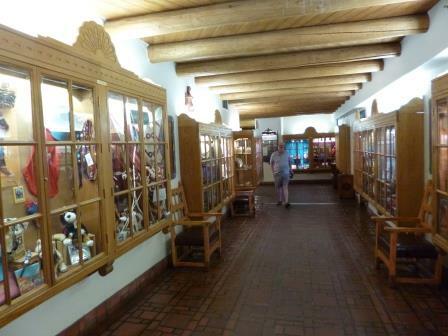 With admission you also get to explore the Palace of the Governors, one of the few surviving real adobe buildings in Santa Fe (the others are brick coated with stucco in imitation) and probably one of the few single-story palaces in the world. And if you have read Willa Cather’s “Death Comes to the Archbishop” (and I hope you have, as a prep for your Santa Fe visit) you will find portraits of ALL the main characters hanging in the Museum or the Palace – instantly recognizable. On your way back to La Fonda, be sure to explore inside the Cathedral of St. Francis of Assisi which faces the square. 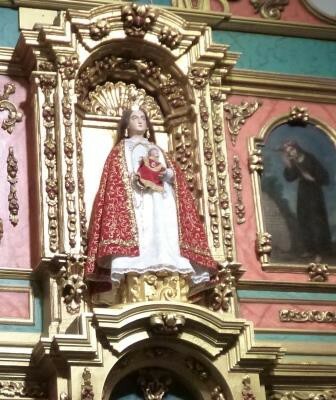 Again, if you have read “DCttAB” you cannot fail to be moved by the statue of the austere Archbishop Lamy who reformed and re-energized the New Mexico church mission, and by the little wooden Madonna, regally gowned by the devout needlewomen of the Santa Fe diocese, who is the core of Catholic tradition in the area, paraded around the square in her finery once eacy year. You’ve walked a lot. 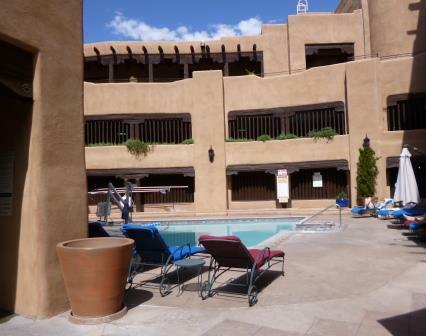 Time to relax at the pool in the La Fonda central courtyard. It’s shielded from wind and sun and kept at a perfect temperature. Once you are dry and dressed, present yourself at the Bell Tower Bar at the very top of the LaFonda, with a 360 degree view of the square,the town, the mountains, and the clouds. Everyone up here is in a good mood – what nicer place could there be to strike up a conversation with the folks around the firepit or cocktail table? And if you have not filled yourself up on appetizers at the Bell Tower, finish off your Santa Fe day at La Plazuela, the restaurant in the former courtyard (now roofed with a skylight) around the fountain at the center of La Fonda. There are other restaurants in town which boast Michelin stars, but none that can boast more atmosphere or history. I recommend the pork tamales. The evening is up to you. That sounds like a delightful day! 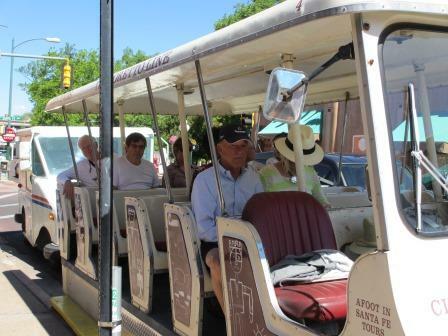 I haven’t been to Santa Fe–maybe I should do something about that! I doubt I would have gone had there not been a family celebration taking me nearby, but now I want to go back!